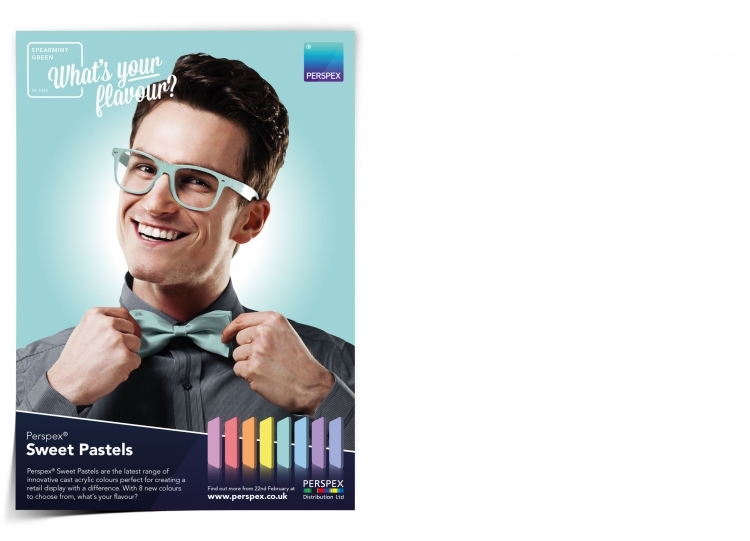 Perspex; a global acrylic sheet manufacturer (part of the Lucite International Group of companies) approached Progression Design to develop a concept to launch their new pastel colour range called ‘Sweet Pastels’, aimed at the UK retail industry. 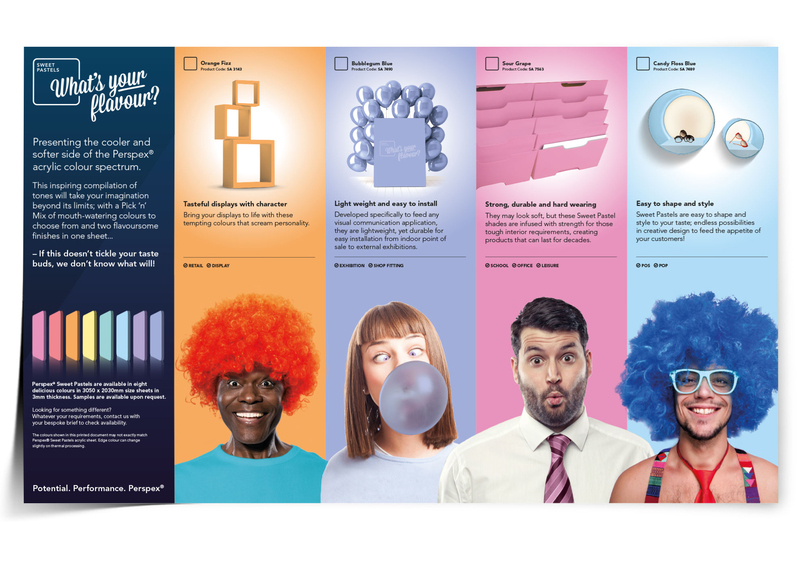 Whilst only having the colour chips and the range title for inspiration, Progression developed a concept whereby each pastel colour became a ‘character’ in their own right; Spearmint Green being the flamboyant nerd, Raspberry Sherbet the flaming redhead, etc. With colour being at the centre of the campaign Progression Design alts had to recolour the stock images used, to ensure for example, the Spearmint Green glasses where the correct colour. 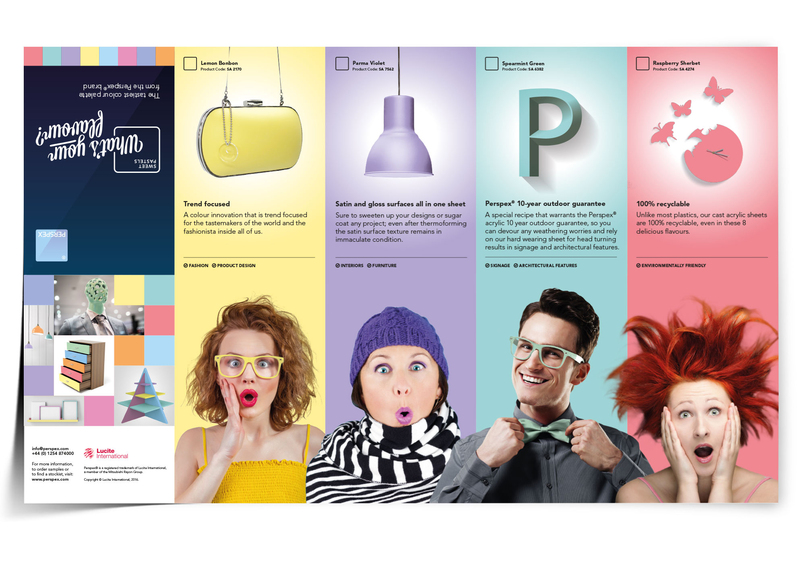 Progression Design also developed the strapline ‘What’s your flavour?’ Asking the viewer to decide which character/flavour they were. Whilst being a fun, personality-driven approach the concept also allowed us to showcase the various uses of the Perspex sheet and showcase it’s unique, market-leading properties. The product launch was seen by Perspex as being very successful, the sales team commenting on how potential clients remembered seeing the campaign and enjoying the introduction of humour into what can sometimes be quite a dry marketplace.